Beautiful light fixture to compliment my powder room. Very good quality crystals... looks much more expensive then the price. I would recommend highly this vanity light! This stunning 6-light Crystal Vanity Light only uses the best quality material and workmanship ensuring a beautiful heirloom quality piece. Featuring a radiant Chrome finish and finely cut premium grade crystals with a lead content of 30-percent, this elegant wall light will provide any room additional light and sparkle. Dimensions 24.0 In. X 24.0 In. X 6.25 In. I bought this light for my powder room. Package showed no damage, but some of the golf ball sized crystals inside had cracked to our disappointment. No problem! I called Overstock and was extremely impressed with their customer service and followup--received replacements from lighting company within a week. The light is beautiful and easy to assemble by a DIYer. 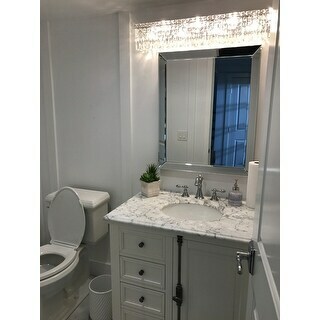 I placed 40W equivalent LED lights and it has a perfect warm light to the small powder room. I definitely would recommend this light, as well as Overstock.com. Absolutely stunning!! These look more amazing in. I bought this from Overstock to match a ceiling fixture I had purchased from another vendor. I was surprised when it arrived that it was made by the same company and same material. Since I had been through installation and assembly before, it didn't take me as long as the ceiling fixture did. It does require hanging all the crystal beads and balls, but as long as you have gloves on and shine each piece before attaching, it is not a big deal. My wife is very happy with the completed project. Order from Reputable Places - not Overstock. Some pieces were broken upon arrival. Because the return window had passed - I didn't get around to requesting replacement parts on time within the 30 days, so they are refusing to send me replacement parts. Some of the crystals are scratched and chipped, others are just broken. I hung the fixture nonetheless, and it looks good except for the missing pieces. The manufacturer has a very dumb policy and overstock just doesn't care enough to go an extra step and get 3 parts. I did pay the full price for this - 3 crystal pieces that aren't amazing quality and are inexpensive was not replaced for me. Never ordering from here again. 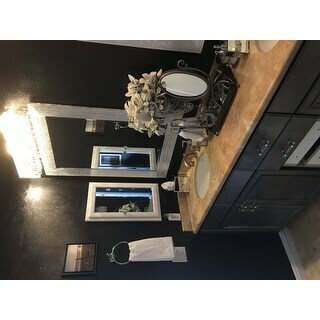 I wanted to add style and glamour to a blah bathroom. This fixture does the job. The light is very bright, which is great for applying makeup or shaving. All crystals must be individually hung, which takes time. It is a very heavy piece, so install with care. We love the look! This light fixture is absolutely beautiful! 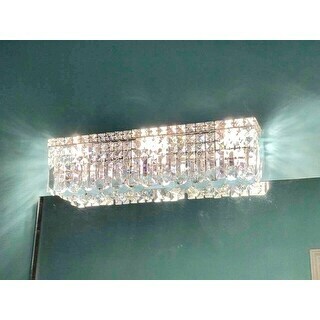 I needed a bright glam light fixture with lots of light, sparkle and bling. This light was perfect! 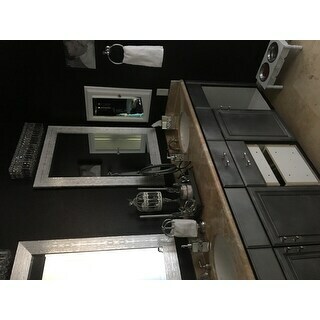 My newly remodeled bathroom looks fabulous! This light fixture has become the focal point of our entire guest bath. The combination of crystals that even wrap around the fixture leaves no detail overlooked. The product was exactly as described and arrived in a timely manner. Each set of crystals was individually wrapped and labeled for easy installation. I would highly recommend this product. Our electrician hung it up in our daughter's bathroom and this 6'4 man stood back and said, "Even I feel like a princess"! It's worth the money! Gorgeous!!! I purchased this to go over my vanity mirror in the master bathroom and it is stunning. Buy it now because you won't regret it. The only disadvantage is when the light bulbs need to be replaced you have to take down each ball/crystal. Small price to pay for beauty. Thanks, Overstock for another amazing buy! Beautiful! Even prettier in person! This is the perfect fixture above any bathroom sink! Beautiful!! I so disappointed when these first started getting them put up but once light bulbs and crystals I totally changed my mind the are gorgeous lit up and with the new mirrors I put up! 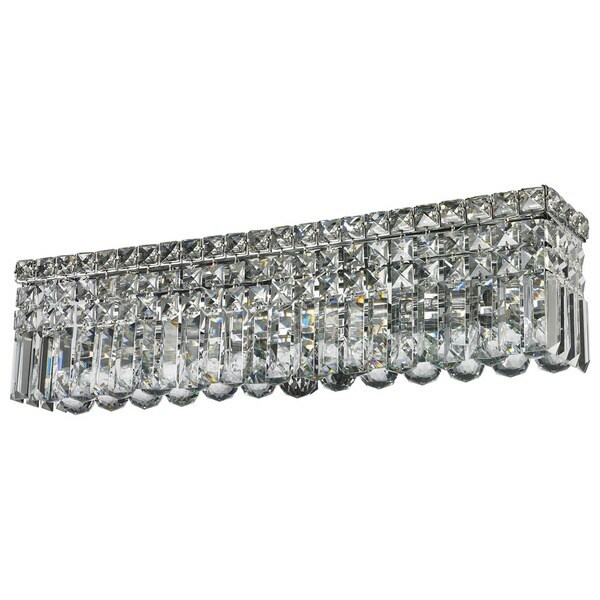 The crystals on this vanity light are top quality and shine and we love the design; however, it was very time-consuming and difficult to install and assemble. It is also really tough to clean, but I still love it hanging above our mirror in the bathroom. Gives our bathroom such a chic look. Oh my gosh.., I only give it four star because two of the light were not working after it was installed by the electrician, other than that it would give it 5 stars. Also..., the light bulbs are hard to put into the fixture. I must upgrade my previous review to 5 stars. We love the light and Overstock Customer Service shipped not only the replacement crystal balls, but sent a few extras!! Thank you Overstock Customer Service!! This is a really pretty light, heavy and appears to be very well made; however, it arrived with 2 broken & several chipped crystal balls. Customer support is hopeful this will come back into stock soon and the balls can be replaced. If not, the two missing balls are in an area that is not obvious & we'll keep it anyway. "Can you add a dimmer to this fixture?" "What is the entire width of this item? It cannot be 16” if the base plate alone is 20”. Also is there a firm eta on the restock availability of this item?" "Will this be coming back in stock?" "How large is the base plate by which it is mounted to the wall?" "can you give me the model number of the light bulb for this product please?" "How far from the wall does it extend please."